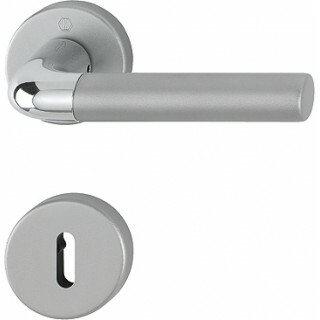 Interior door handle Hoppe aluminium Bremen series on round rose. A door handle very beautiful, with a combination of two-color finish. The structure is made of lightweight aluminum very resistant, with a 10 year warranty on functionality. The surface is in matt titanium color, pleasant to the touch and sight. You can execute the installation by yourself thanks to the new quick-fit connection patent by Hoppe. Ultimately, it is a door handle recommended given the excellent value for money.